National Geeographic Kids 125 True Stories of Amazing Pets by National Geographic Kids. Review: Do you like amazing animal stories? Well, then 125 True Stories of Amazing Pets is the book for you! This book is filled with exciting facts about some of the most unusual pets. 125 True Stories of Amazing Pets will blow your mind. This book proves that there are more animals that are amazing yet to be seen. This book has many subheadings that you can get the general idea what the stories are about. But the stories will yet amaze you. One of the stories had a bunny that was 4 feet tall. That's almost as tall as me! This book would be great for 5-12 year olds. There may be a few hard words every now and then but it's not a big deal. It is a fascinating book so it won't creep them out or anything. Even if you don't like animals that much, you will like this. I recommend this book to everybody in the world because who doesn't find amazing things amazing? 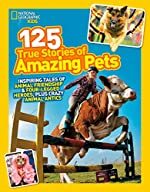 We would like to thank National Geographic Kids for providing a copy of National Geeographic Kids 125 True Stories of Amazing Pets for this review. Have you read National Geeographic Kids 125 True Stories of Amazing Pets? How would you rate it?